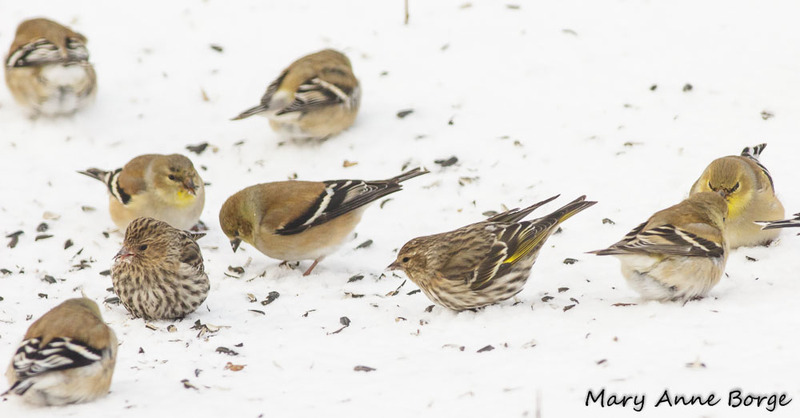 joined by a trio of Pine Siskins, visiting us for the past few weeks. 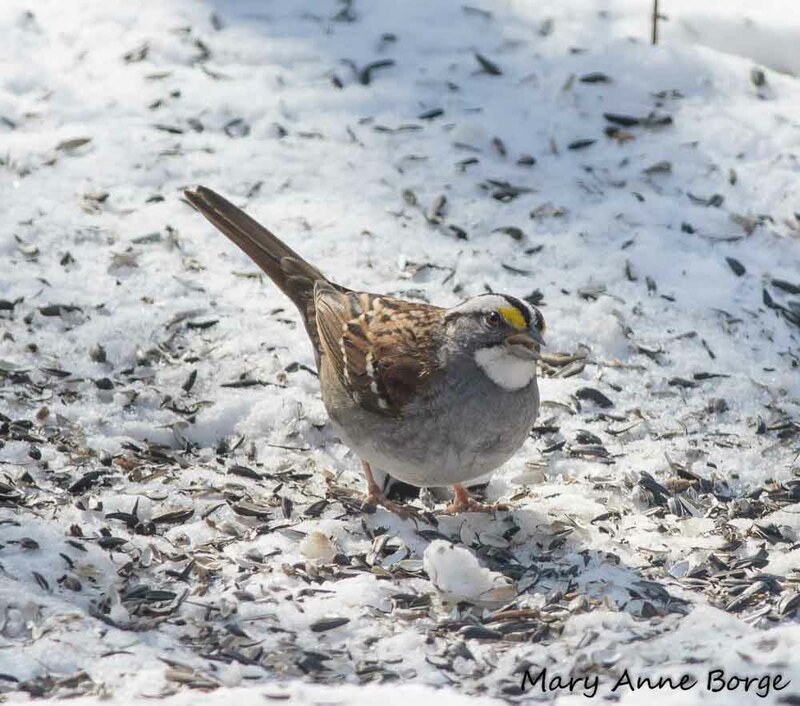 Birds take advantage of the food we provide, but what else do they eat in winter? Just as in the warm months, insects are still an important part of their diet. 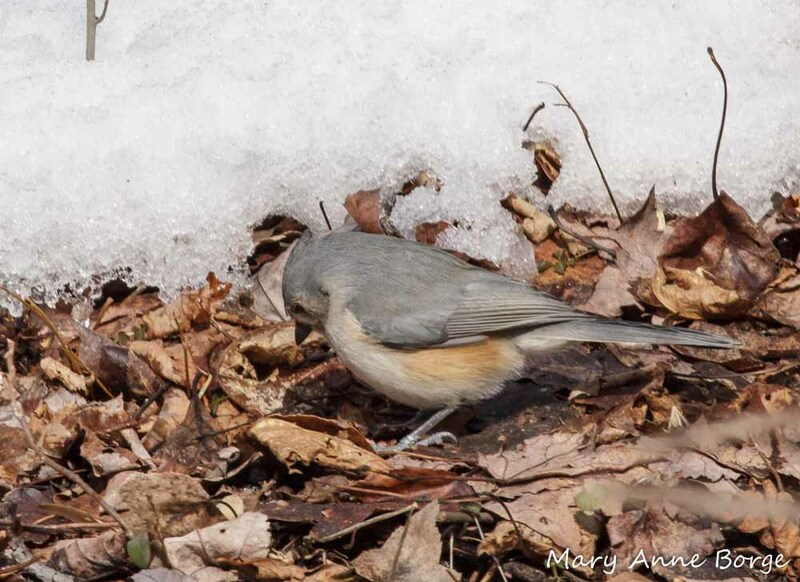 As soon as there is open ground, birds begin tossing and probing leaves, looking for overwintering insects to eat. 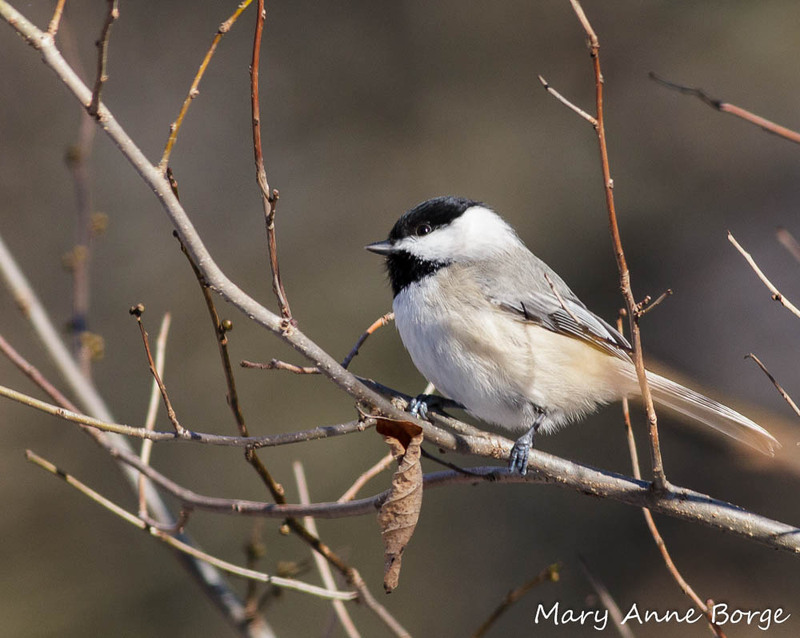 Watch for Chickadees and Titmice searching branches of trees and shrubs for eggs, chrysalises, caterpillars and other insects sheltering there. 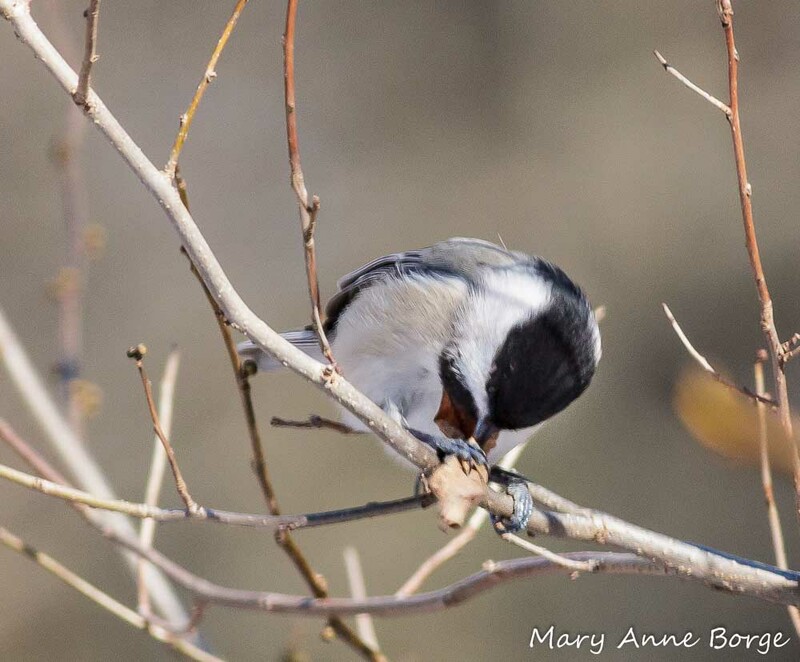 Chickadees investigate curled leaves clinging to branches, knowing that a leaf might be a winter insect shelter. 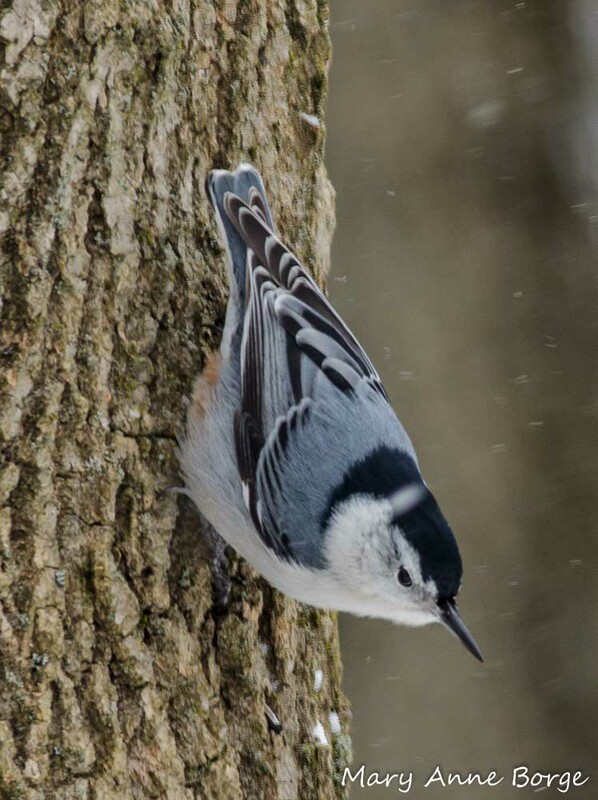 Nuthatches travel down tree trunks probing bark crevices, looking for a winter insect snack. 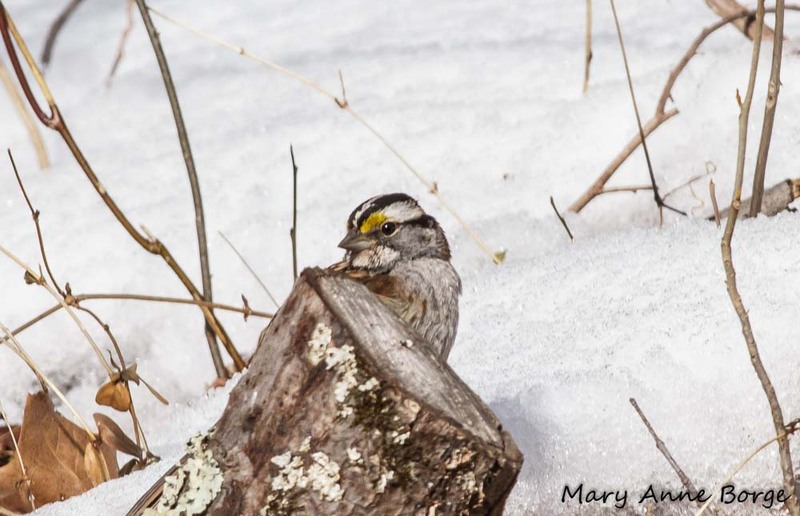 Brown Creepers cover the same territory in the opposite direction, eating what the Nuthatches miss. 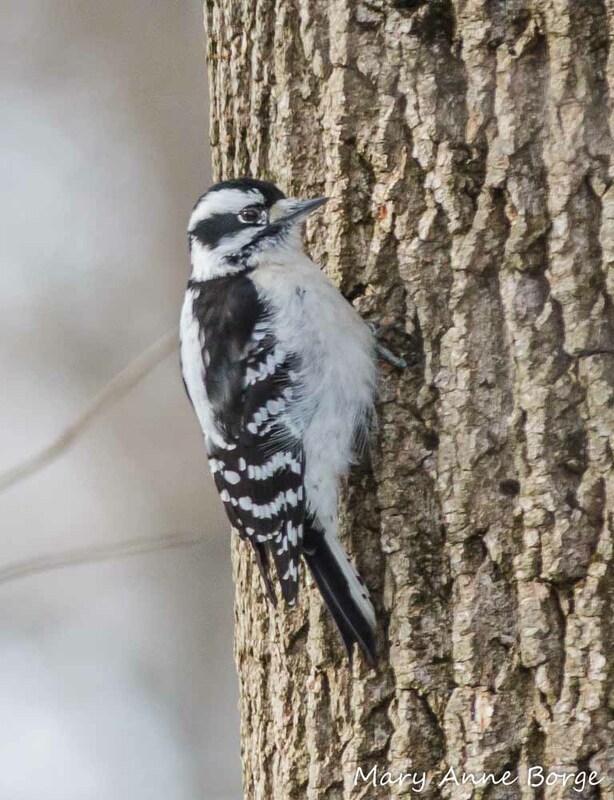 Downy Woodpeckers explore both branches and tree trunks looking for food. found a branch that promised her an insect reward, probably Carpenter Ants. Signs of spring are beginning to show. 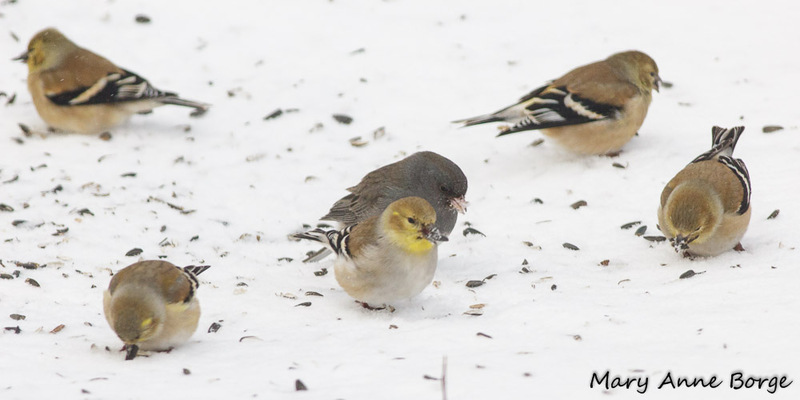 Look closely at the plumage of male Goldfinches and you’ll see some splotches of bright yellow, the beginning of their molt to summer garb. 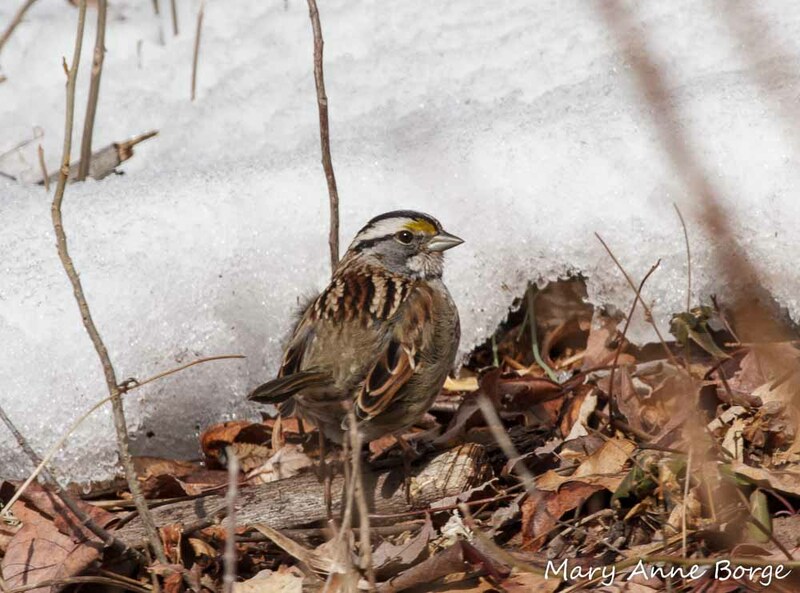 This White-throated Sparrow is already sporting its summer suit, in spite of the snow! 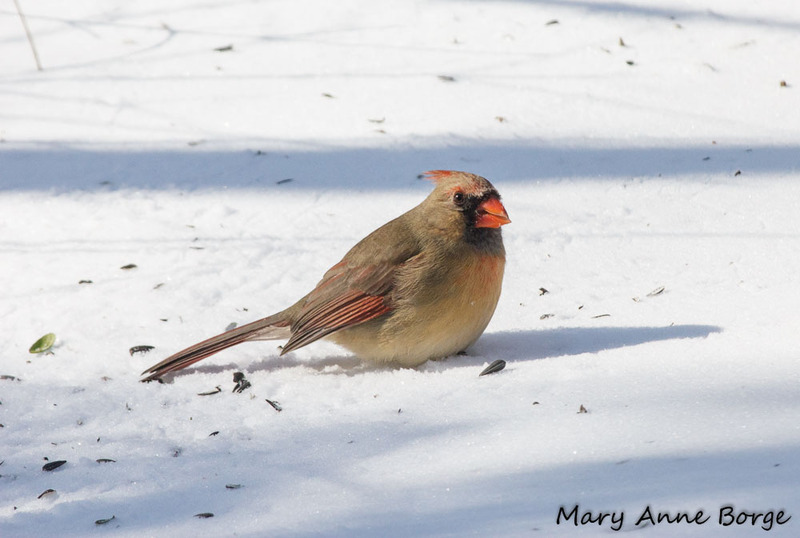 This entry was posted in Birds, Other Insects and Spiders and tagged Bird food, nature, Nature in Winter, Winter by Mary Anne Borge. Bookmark the permalink. The other week we had a huge flock of robins here feasting on holly berries. Quite a sight. Think they are ready for better weather! 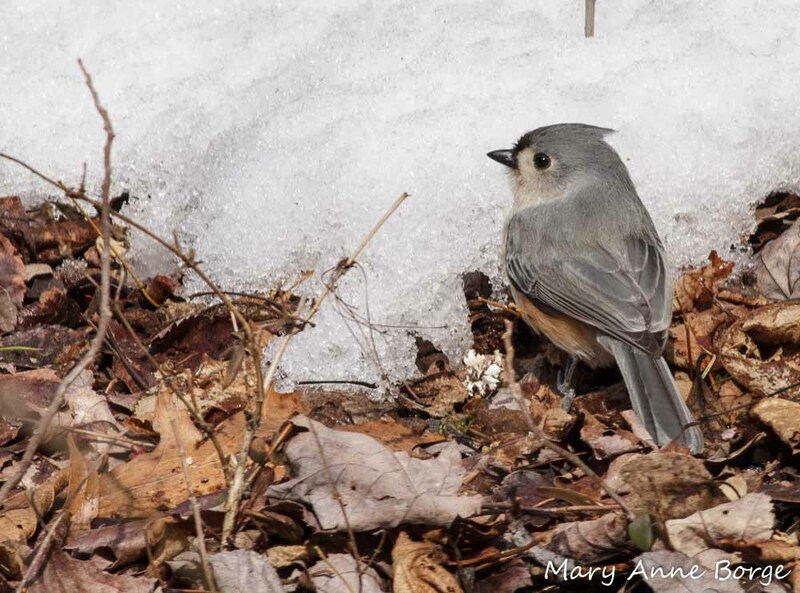 I saw just 2 or 3 at BHWP the other day, all tossing leaves looking for insects. I was just listening to a weather forecast. It sounds like there’s still some winter weather to come before we see the spring. 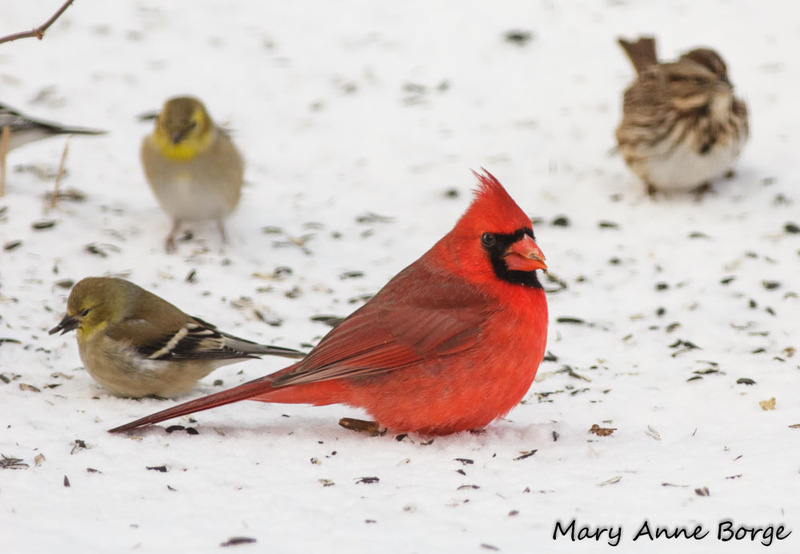 We have male and female cardinals feeding pecking sunflower seeds from the hanging feeder, as well as feeding on the ground – here in Bucks County. As usual, your photos are superb! Thanks, Pat! The ground feeders seem to be branching out. 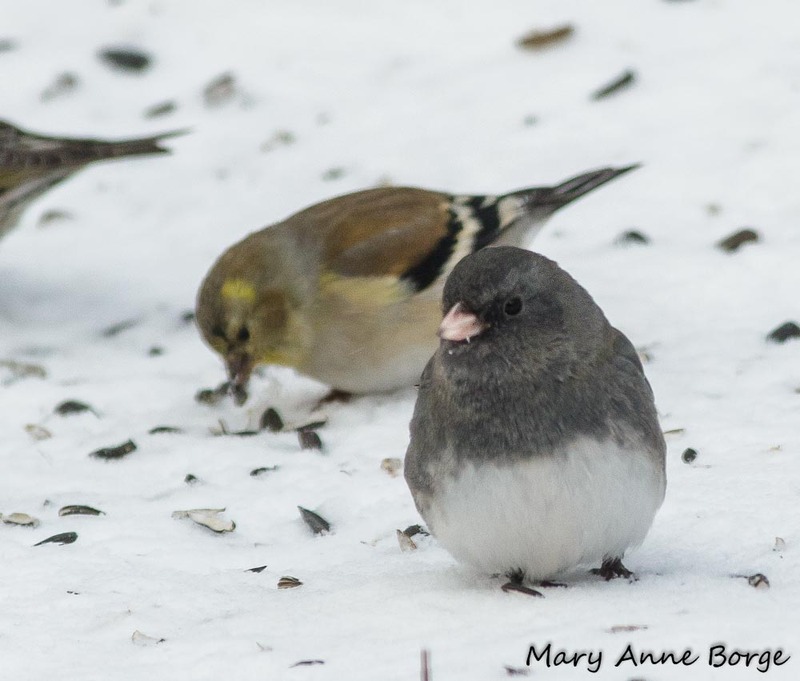 We’ve had Juncos and White-throated Sparrows at our feeders, too. When the ground is snow-covered it’s time to get creative! 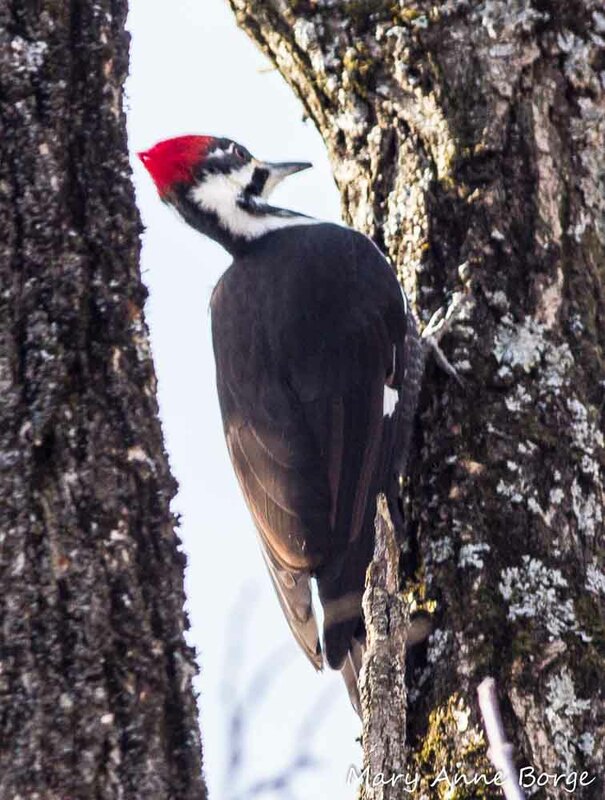 Such varied & detailed sightings; wonderful photos including the pileated woodpecker; plus evidence of Spring on the march! Perfect way to start the day. Thank you! Thanks, Monica! A few days ago I saw two Skunk Cabbage that were just starting to open. More signs of spring! Thanks for the information and exceptionally sharp and close up photos. We have more Pine Siskins here in NE Alabama than in any of the previous 10 years. 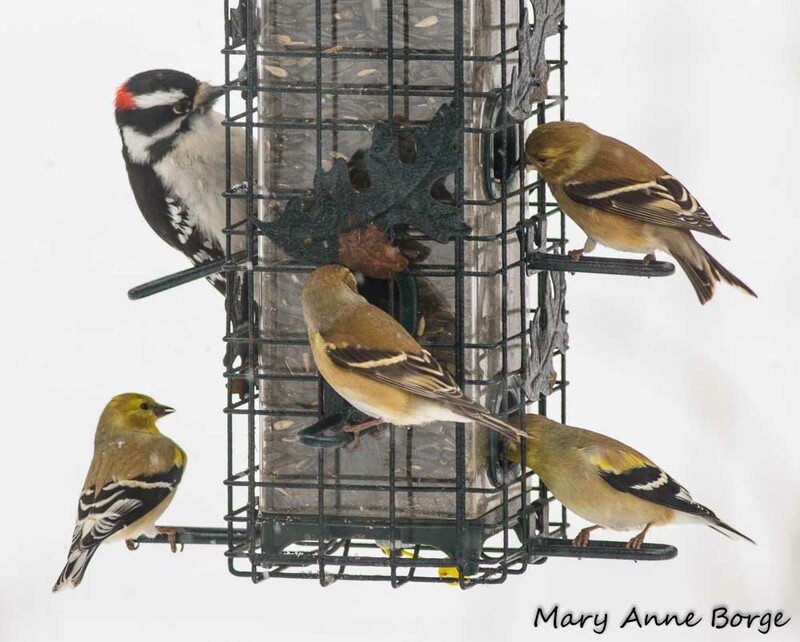 Literally hundreds on our feeders. Would you please comment on the camera and lens you used, just curious as a photographer. Thank you! Interesting that you’ve had that many Pine Siskins as far south as Alabama. I’m in New Jersey. 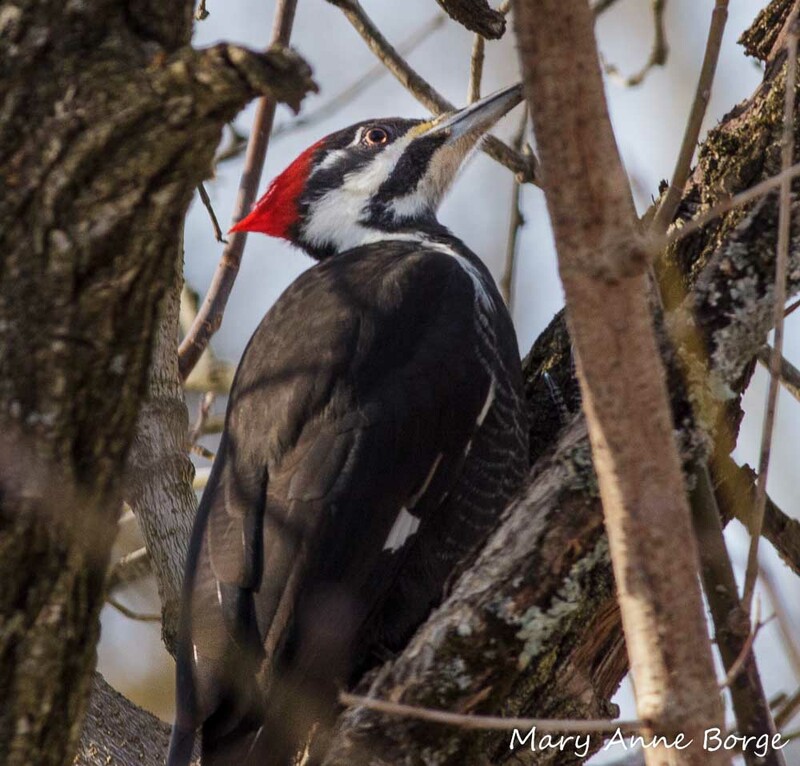 I use a Canon Rebel T3i, and for bird shots generally I use a Canon 400mm f5.6L lens. Very interesting information and excellent photos. 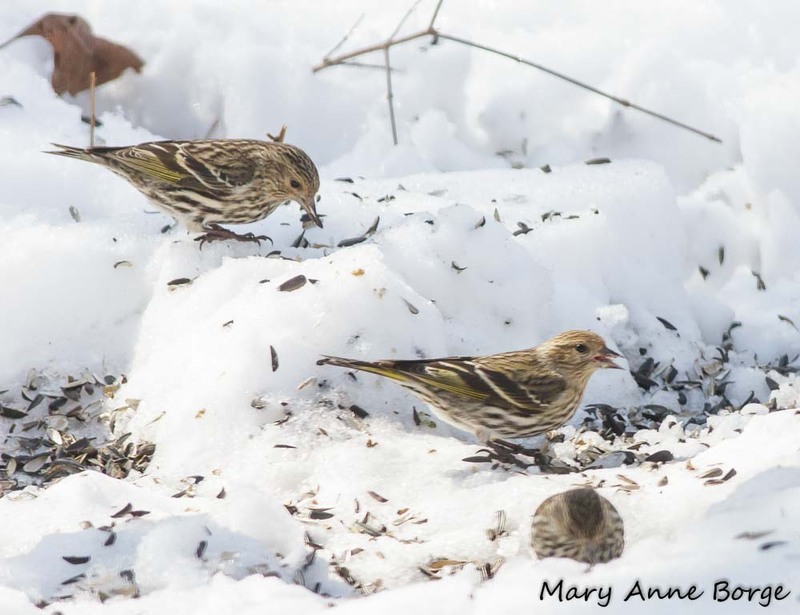 We have had hundreds of Pine Siskins at our feeders this year in Northeast Alabama. Far more than in any of the last 10 years. Would you please tell me what camera and lens you are using for your exceptionally sharp photos. Just my curiosity as a photographer. Thanks.